2019 Update: If you like this pattern, check out the new Dishcloth Pattern every month of this year. Links to be found here. Well, my dishwasher died on Boxing Day, so I have been doing holiday dishes by hand for over a week. So it was time to knit dishcloths. 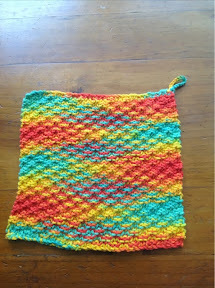 This is a super simple, yet highly effective basic dishcloth that knits up quickly. I know it would make a great small handmade gift. I already had some wonderful dk (8ply) cotton yarn my stash. Complete 51 rows using the pattern above. On the 52nd row, cast off, keeping the pattern of the row. Crochet the tails into a loop (I hang this to dry off the tap in my kitchen). It’s from peaches and creme, all their colours are beautiful. 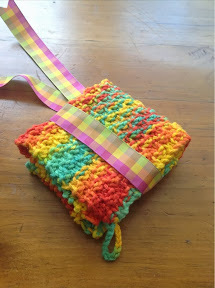 http://www.peachesandcreme.com – they have a beautiful range of cotton yarns. can you use any size needles?